The vision of Summit Christian Academy is to prepare students academically, socially, and spiritually, equipping them to discern truth, articulate their faith, and to serve others for the glory of Jesus Christ. 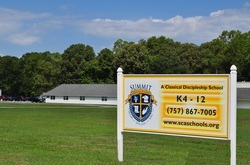 The mission of Summit Christian Academy is to partner with parents to educate and disciple young men and women through a Christian and classical education. The leadership at Summit Christian Academy, in close association with parents, is committed to equipping students for earthly and eternal success based on the following six core values: Faith, Humility, Integrity, Scholarship, Service, and Wisdom. Faith - We believe that Christ came to earth, lived a sinless life, died on a cross, rose again on the third day, and ascended into heaven as written in God’s Word. We believe that we are saved by grace through faith in the atoning sacrifice of Christ on the cross, and we are reborn to a new life through the power that raised Christ from the dead. Consistent with such faith we endeavor to glorify Christ in obedience to His Word. Humility - We believe in a proper estimation of ourselves in light of God’s Word. We believe that our power comes from Him and not from ourselves. As a result of such humility, we consider the needs and interests of others in the context of a shared community that values and encourages each of us to live modestly and simply. Integrity - We seek to be true to the principles of God’s Word. We strive to act in accordance with these principles and also to teach others through both direct instruction and careful example. 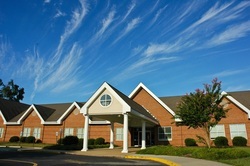 Scholarship - We seek to uphold superior standards of academic excellence, intellectual honesty and accountability. We seek to be well grounded in knowledge, to grow in intellectual maturity, and to exercise critical thinking skills. We seek to be lifelong learners. Service - We seek to be Christian servants with compassionate hearts that reflect genuine attitudes of humility and obedience. Through acts of service to our community, we evangelize by word and by example as we reach out to our community. Wisdom - We seek to act wisely and judge correctly, clearly distinguishing truth from error, right from wrong, and good from evil. We seek to correctly and effectively apply knowledge learned in accordance with such wisdom. Love - We seek to love others as God loves us in His indescribable gift of Jesus Christ. We believe in showing kind regard and compassion to all in our sphere of influence.